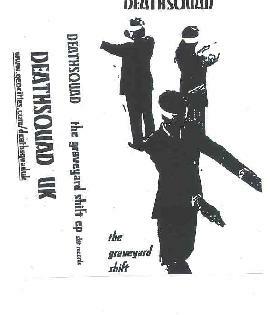 Deathsquad - "The Graveyard Shift ep"
Deathsquad is a British trio that play lo-fi but well written rockers. The band consists of Martin Thug D on keyboards and vocals, Nick De Squad on guitars, keyboards, and vocals, and Andy Kyriscum on bass and guitars. Their web site outlines a somewhat extensive discography though this 3-song cassette is the first from them I've heard. "I Am A Weekend Warfare Fan" opens the set with a thudding bass, electro percussion, dark eerie synth lines, and angry ranting vocals. The music is pretty lo-fi but I really liked the combination of vocals and dark melodic synths. An interesting contrast that works well together. "Life Kills" features slowly wailing guitar licks and the same vocals but this time more drugged than angry. The guitar gives a pretty trippy edge to the music but it's still got a welcome dirty quality to it as well. "The Ming" is by far the strongest and best developed tune of the three. The vocals are completely different taking on a 60's San Francisco flower power psych quality which floats along nicely accompanied by the melting guitar. But soon the guitar gets aggressive and things start to rock out as it blasts out chords to the steady electro percussion beat and the synth holds down the melody. The vocals retain their ethereal edge throughout and musically it changes quite a bit moving through quieter and harsher portions. The melodies are always trippy and drippy sweet making for a nifty lo-fi psychedelic song. The promo sheets states that Deathsquad have a CD coming out soon on Mick Magic's Music & Elsewhere project and sure enough I checked out the M&E web site and their most recent news item makes this announcement. Check it out at the M&E web site. You can visit Deathsquad at their web site. Contact via snail mail c/o Nick B; Hill House; Bowes; Nr Barnard Castle; County Durham; DL12 9LG; UK.